What’s the biggest obstacle standing between you and financial freedom / your idea of success ?! 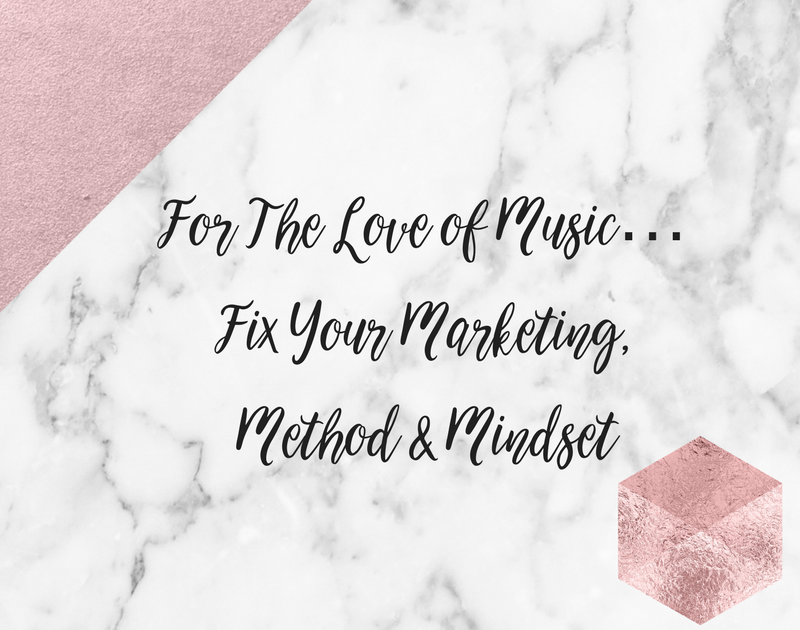 For the love of Music, guys, you need to fix your Marketing, your Method, and your Mindset! Before we do any of that we first need to ascertain what your goal is so we can set the goal posts. This is also the crucial first step in fixing your mindset. If you’re not completely clear on what you want then you’ll never get it. Period. Take five minutes, turn off your phone, remove yourself from any disturbances and VISUALISE the dream. Don’t feel silly. If you’ve never visualised before you might feel slightly ridiculous but trust me just a little when I promiseyou it’s a great first step. Now, daydream away as many minutes and hours as you like so you have a full and complete image of exactly what your end goal is. What it looks like, feels like, where you are, who you’re with… picture your environment, what are you doing, what are you saying, what are you eating?! It sounds bonkers but I need you to harness that vivid imagination you had as a child and run away with it… run away with it until you catch yourself grinning from ear to ear at this picture you’ve painted in your head and until it makes you feel limitless! Then… stop. Write it down. Quick. I want you to revisit this every single day. First thing in the morning before you do anything or even think about anything. This is changing your Mindset. By leveraging the power of the universe and utilising the law of attraction, the other two elements of this threefold approach to success become effortless. I can’t stress it enough. Mindset is the most powerful tool you can have. It’s free. It’s yours. And you haven’t been using it… that’s why you’re reading this and asking me how the hell I did it! I could do a whole course on getting into the right Mindset (in fact I might just do that, hint hint wink wink) but first let’s take a look at Method and Marketing. What is your niche? Can you define it? How do your clients want you to communicate with them? What value are you adding to your clients life? Can you identify a gap in the market? Which skills are missing from your make up? Who do you know who could help (in any capacity)? What’s the financial status quo? What do you have, what do you need? These questions (and hundreds more, which I will share another time to help you define your Method) are the starting point for figuring out the steps necessary to achieve the dream. Define your ideal clients, your niche, your offering, your price point, and your means and manner of communication and we’re half way there. Communication and content is King. Those of you who are already well versed in marketing jargon will have heard the phrase ‘Content is King’ before, but it’s nothing without powerful communication. So we move on to Marketing. Marketing, in a nutshell, is how we Communicate our Content to our Clients (by content I mean your service/product) so we can start a Conversation. And, Marketing, really not as scary as you might think… in fact, saturated as the net might be, it’s far more fun navigating the digital world than it is licking and sticking envelopes… trust me I’ve been there… doesn’t taste great! So, first things first… tricks you should probably avoid!! Unnecessary expenditure on fancy websites. A landing page is a perfectly good (and less risky) way to start. Hitting the ‘Boost Post’ button on Facebook… a sure fire way to flush money down the loo if you’re not well versed in Facebook algorithms. Time wasting on unnecessary fluffiness. I love a bit of fluff, I do, but don’t kill time tweaking literature, emails, logos, images, text fonts and sizes… test that stuff instead and see how your audience react. We’re always too scared to jump in and launch a marketing campaign… just do it!! Avoid the hard sell. There’s an 80/20 rule most marketers abide to. 80% of your communication with your clients and potential clients should be valuable content. The other 20% should be selling your wares! Don’t be disheartened or disappointed if your first attempt doesn’t go to plan. Take heart that you’ve at least found one way that doesn’t work! Then try 100 times over until you find the way that does work! Don’t assume you can do it all on your own. You’re only human. Ask for help! It’s OK! Establish your brand. By brand, I mean your ‘slogan/tag line/motto’, the colours in your branding (be that logo or just web presence), your image, and your message. Create your web presence: Website/landing page, plus all relevant social media platforms (refer back to your method questions on communication), plenty of online business directories, all whilst keeping your branding consistent. Get your automation software ready to handle all those clients and enquiries that are about to come flooding in! I recommend Mailchimp for emails if you’re just starting out, Buffer for social media scheduling, Stripe for taking payments (because we WILL be taking lots of them), Xero to handle your book work and accounts, and Zapier to handle the integration of all these softwares with each other. If you’re offering an appointment based service, I would also recommend using an automated booking system with Stripe and/or Xero integration (both softwares offer a list of compatible recommended apps), and if you’re a product based ‘business’, I would recommend a shopping cart software such as Shopify (again look to Stripe and Xero for a complete list of recommended and API integration-able apps!). Using Mailchimp, set up an automation sequence of no more than three emails to be sent out at 24 hour intervals, introducing yourself to your client, showing interest in them and asking about their desires (so you can better understand how to serve their needs), and then send them something of value as a thankyou for popping up in your inbox and to show them that you’re invested in their ‘desired end result’. Automate this process so you don’t copy and paste the same three emails a gazillion times. Now your conversation is ready to go, you need some clients to converse with, so let’s get some content out there! Using Facebook ads is (at the moment) far quicker and more effective than Google Adwords so using Power Editor in Facebook for Business (go to business.facebook.com and use the menu at the top), create a Campaign, Advert Set and Advert. In your Advert Set use the audience section to really define your demographic, using the answers from your Method questions to guide you, to ensure your ad reaches your ideal client! In the Advert section you’ll see you have lots of options for text. Keep it short, clear and to the point. People don’t stop scrolling to read lengthy adverts. Look at your competitors ad headlines to see what they’re writing and adapt yours to make it relevant. It’s so important your potential client understands what they are getting from you within the first three seconds!! Are you offering them something they need/want/desire? If yes then they will click! Woohoo! Select your Facebook Ad to appear in the mobile news feed and desktop news feed (and Instagram if you wish) but deselect all other options for your first campaign (until you become a marketing whizz). Facebook and Instagram ads won’t allow you to use images with more than 20% text so be sure to adhere to this to avoid your ad being rejected. When selecting an image, make sure you use something that is relevant, compelling and appealing to your ideal client. Images of people achieving ‘the desired result’ are usually effective. Now you have a brand, a Facebook advert connected to your brand Facebook page, an email subscribe option on your landing page / website, and an automated email sequence ready to start that conversation with your prospective clients! Well I’m not going to give it ALL away for free am I?! Inspired by what you’ve read so far?! Good!! Then roll your sleeves up and get stuck in because this requires some work but it’s the best kind of work because it’s finally making your dream a reality! And that should feel pretty damn awesome!! Remember always to monitor your Mindset whilst implementing your Method and your Marketing. One without the other will not work. You need to harness all three! Give yourself a week to action the above steps and let me know how you got on. If you’re interested to learn more from me get in touch ?